Personal Interview is a good chance for the candidate to create a good impression and shows your ability and dedication to join the force. Also its very crucial so do not try to bluff if you don't know how to, and always be natural and relaxed because it will be very simple and to the point about your personal life, so try to know yourself better and people around you . 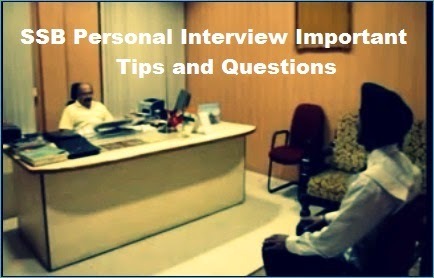 Always prepare for the PERSONAL INTERVIEW before attending SSB Interview because you know the type of question generally asked by the Interviewing Officer. 2. Family background- In this he will throw a ball of questions at you. This is going to be a rapid fire round wherein you will be asked 15-20 questions at once. You are expected to answer these questions keeping in mind what all has been asked. For instance, he may ask you, “Please begin by telling me about your family. Your parents, sister, brother, grandparents etc. what does your father and mother do? What is the annual income of your family? How do you spend time with the members of family? Who are you close to and why? Whom do you approach when in difficult situations or problems? What do you like and dislike in your siblings ? How do you meet your monetary requirement? How do you spend it?" 4. Social background- Here, he will ask you about your hobbies, interests, friends, co-curricular activities etc. Tell them about it. Do not unnecessarily start explaining, until asked to do so. Simply state whatever has been asked. 2. Do you drink/smoke? Why? 3. Why do you want to join Army/ Air force/ Navy? 5. What would you like to improve in yourself? 6. What is your name, meaning of your name, meaning of other member’s names in your family, compare yourself with them, name of place you come from, currently what are you doing? 7. What type of friends you like, what type you do not like, where have you gone and where would you like to go with your friends, why are these people your friends, describe your best friend, compare him with you (appearance, height, texture, thinking, something common in both of you), their hobbies and interests, their way of living life and what do they want to achieve in life. 8. Why do you want to join the defense forces, if not defense then other options, how did you come to the conclusion that you want to join the forces? Did you try for NDA, why didn't you succeed? Why proper efforts were not given? 9. Give 5 current national and international political news. 10. Give 5 current national and international sports news. 11. How would you organize a football match /hike/cycle race/local festival/trek/swimming competition? 12. Why were you weak in some specified sphere, how did you cope up with it? 13. Have you taken coaching, why, what sort of? 14. Your life in college, any memories, what is the difference between your friends at from the place you are coming from and SSB center. If given a chance what would you like to change in your hometown or the place you are coming from (Geographical, economical, agricultural, tourism, traffic etc.) ? For e.g.- Compare your hometown and hometown friends with friends in Pune and Pune as a place itself. Have you ever come before to the SSB center previously? Which places did you visit at the SSB place? 15. When did you have argument with your father, mother or sister? 16. When did u cry last time? In case of the repeaters- Do not think that repeaters are not considered equally as Fresher, apparently repeaters have more chances. They will ask you about your opinion regarding your past performance, they just want to see whether you have the capability to judge yourself or not and your performance in the past attempts. So just think about your performance and tell them where you were lacking earlier and what sort of measures you have taken to perform better in future. Always accept your earlier drawbacks and try to work on them, yes you have more chance to get recommend if you have analyzed what you need to do. Give examples for any incidences that you are going to explain. Speak in relevance to your Self-Description test and PIQ and do not give fakes. Speaking is an art, whatever you speak give proper punctuation, gestures and emotions as necessary in your speech. This was all about SSB Personal Interview Important Tips and Questions for our readers kindly follow the tips given above and start preparing for the SSB. For any details or queries comments are welcomed.